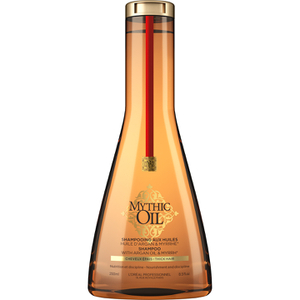 L'Oréal Professionnel Mythic Oil Shampoo for Thick Hair is inspired by the tradition of Indian oil bathing for hair discipline and shine. The Mythic Oil shampoo is concentrated with fairly traded argan oil enriched with Vitamin E, renowned for its deep nourishment qualities leaving hair soft and shining. The treatment is also infused with myrrh extract, popular for its repairing properties. The shampoo produces a generous foam that gently cleanses and tames unruly hair, ideal for those with thick hair. Distribute a small amount evenly through the hair. Massage into the scalp for two minutes. Rinse thoroughly.